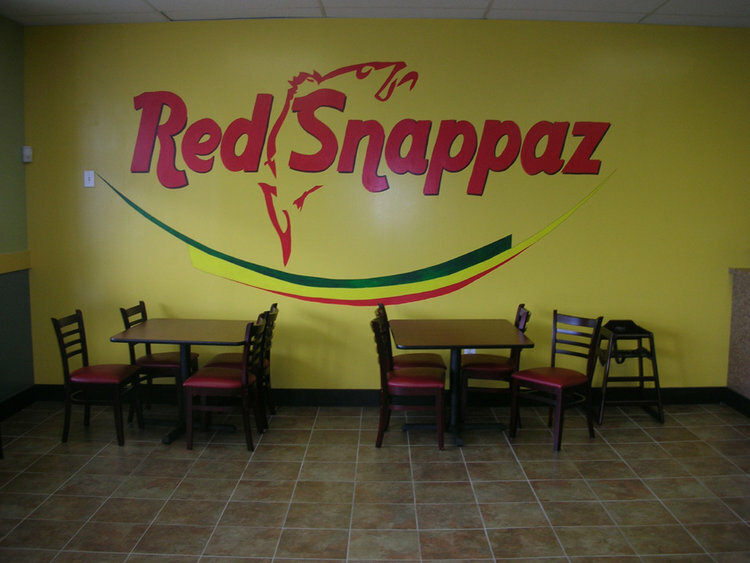 Make a statement that people will remember by turning your establishment into a landmark that will draw business in for years to come! 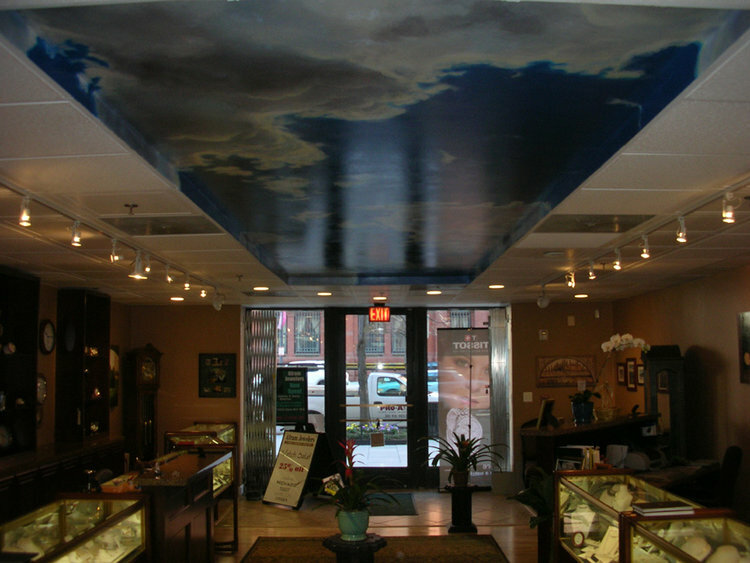 Custom artwork is proven to add to the customer experience. 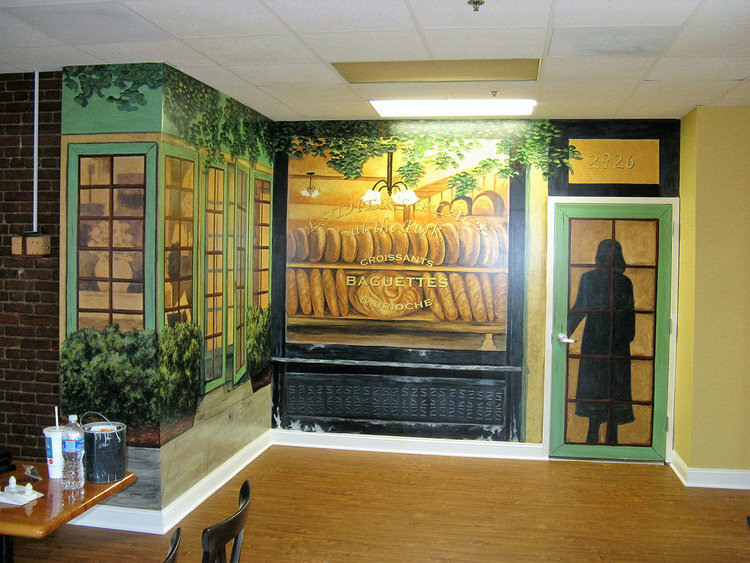 Let BB Murals help you create the ambiance you desire for your customers. 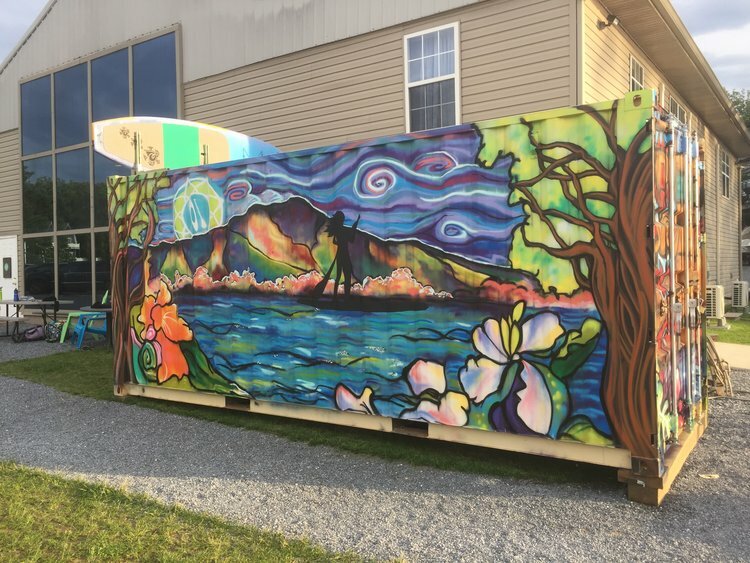 Mantra Fit stand up paddle board container gets a signature new look! 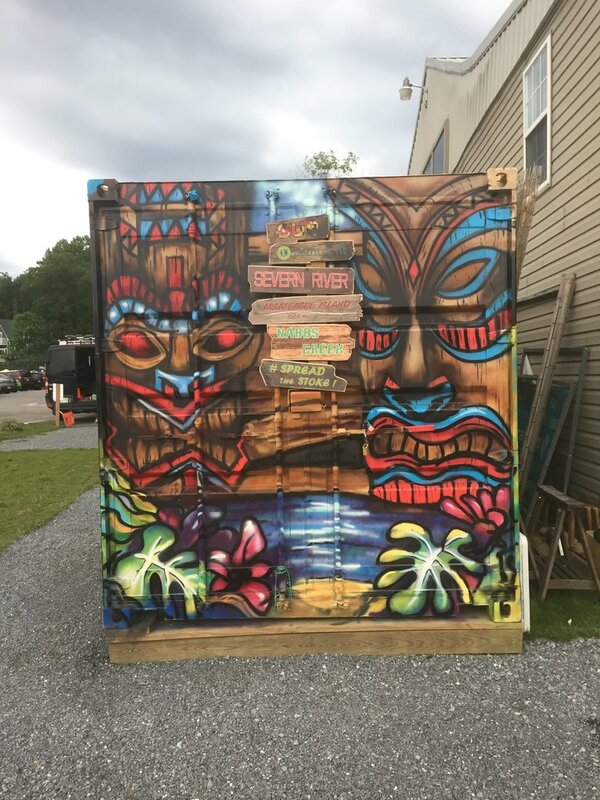 Carleen Birnes, owner of Mantra Fit, which offers stand up paddle board lessons, races, yoga and classes at a new fitness center at the Nabbs Creek Marina in Severna Park, MD, commissioned a mural on their shipping container used to store paddle boards while not in use. 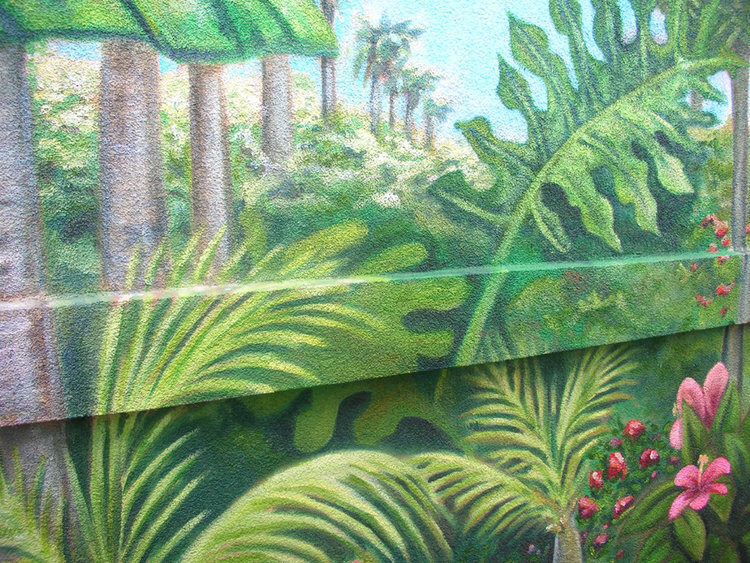 Inspiration was drawn from Hawaiian artist Colleen Wilcox to create a stylishly tropical scene bursting with vibrancy and serenity all at the same time. 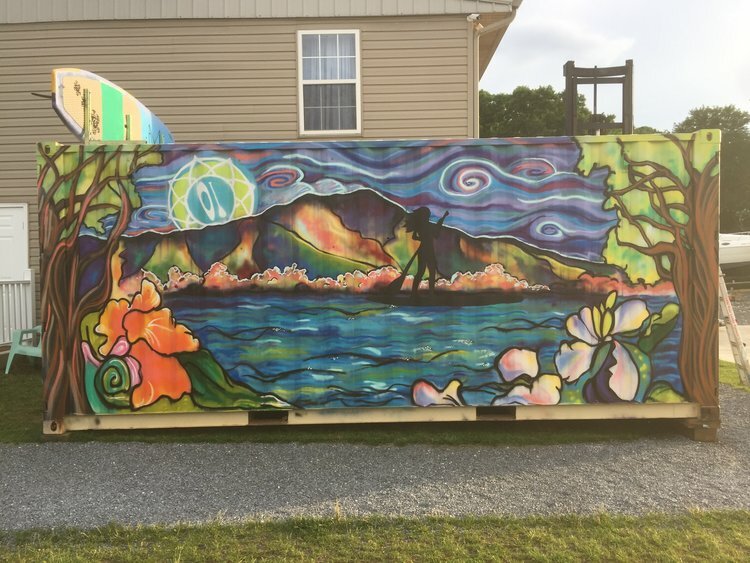 Another fun, and quick, time lapse of me painting two discarded SUP boards to become signage for Mantra Fit in exchange for free SUP lessons for the whole family! 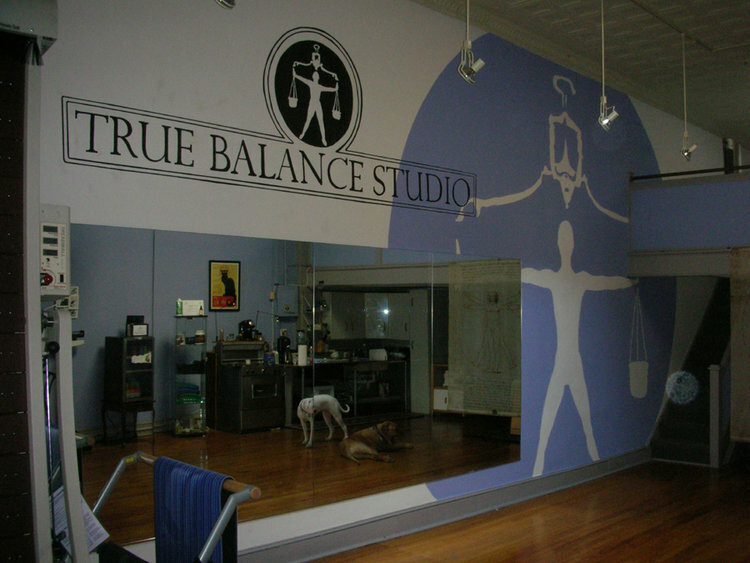 Thanks to Carleen Birnes, owner of Mantra Fit for agreeing to the exchange. Can't wait to get SUPing! 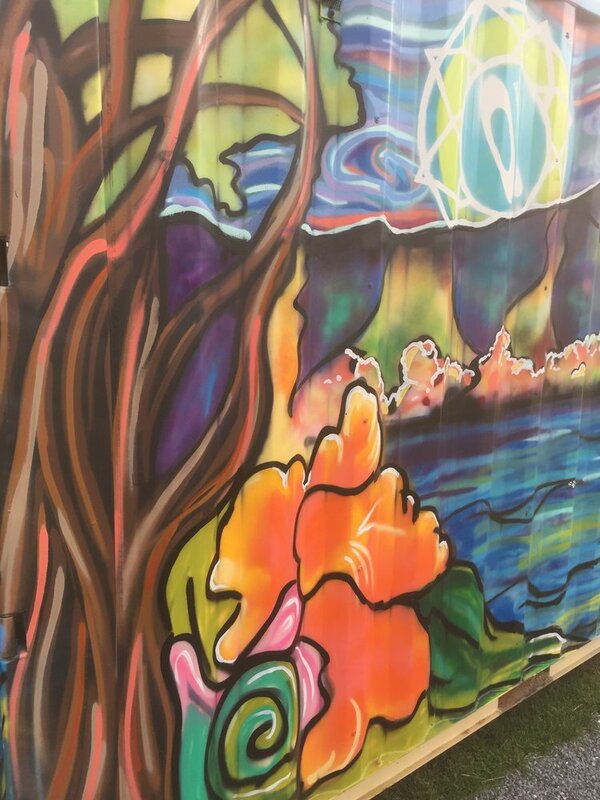 No flat surface is off limits when you have a 8 x 10 foot flatbed printer at your disposal! 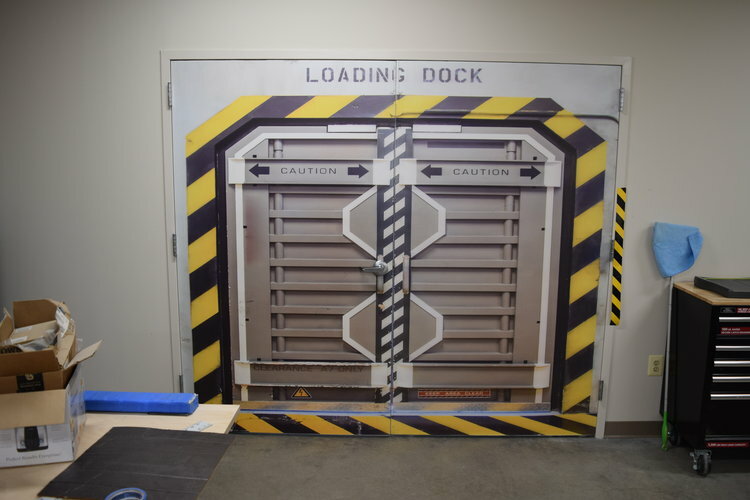 We decided to have a little fun printing custom doors throughout our production facility at ClimbZone. 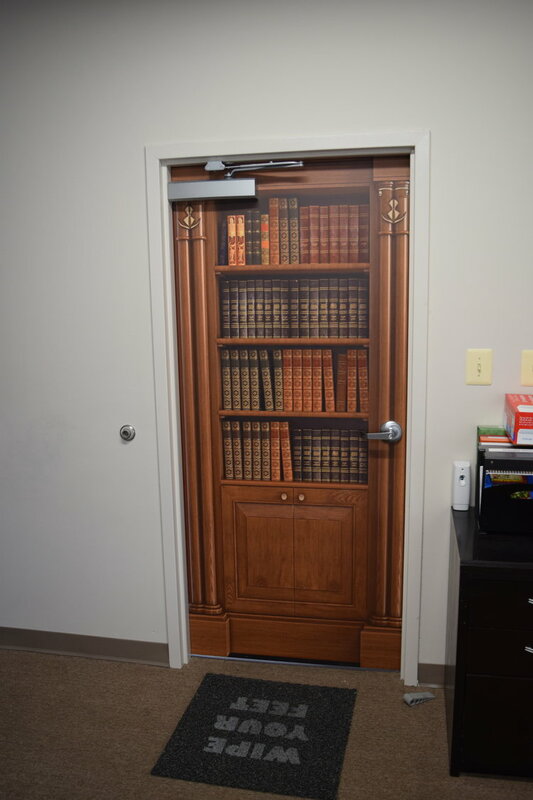 I walk through the Tardis everyday to my office as if I was Dr. Who himself! in exchange for a one year membership to our local pool club. If I could live off the barter system I would. Aside from drawing the Sports Bar crowd, Loafers is increasingly becoming the go to spot for hot, steamed crabs in the area. 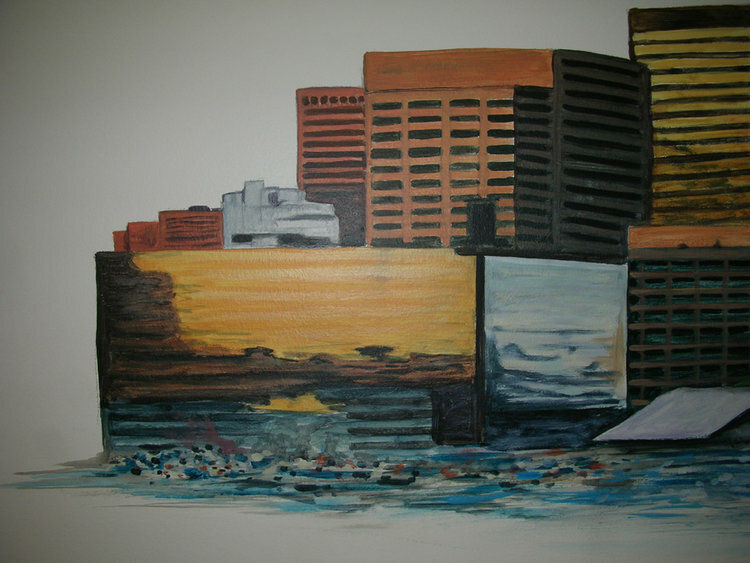 the owner commissioned a bay scene including crabs big enough to see from the highway! 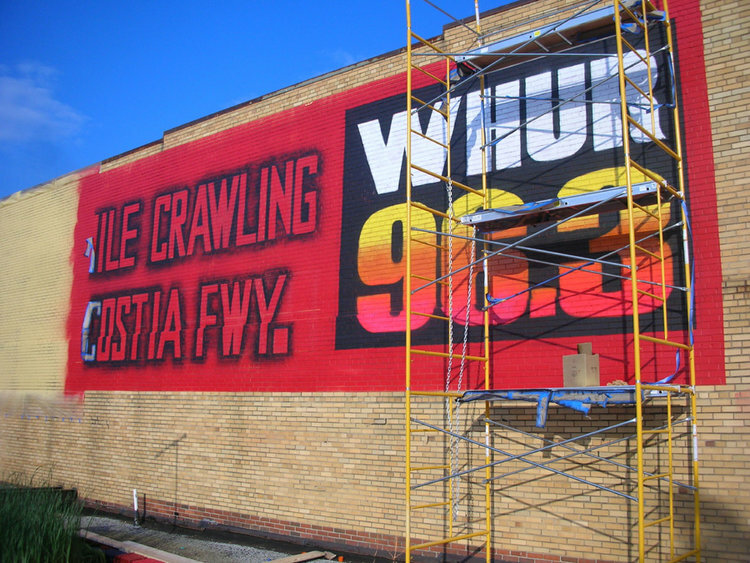 What he received is basically a 90 ft., hand-painted billboard. 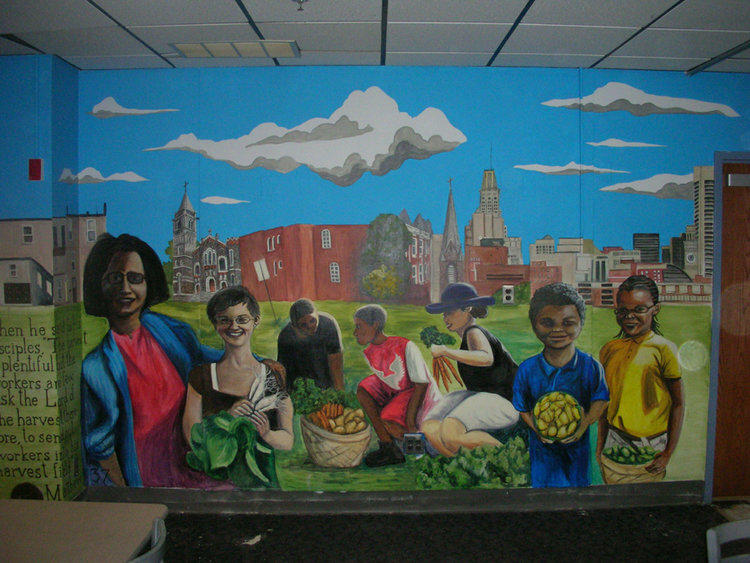 This mural was completed in late summer and I still remember how hot that tin roof was as I spent can after can of spray paint. The Black Kettle, located on Main street in Catonsville, was a brand new establishment in need of a decorated façade that mirrored its hearty, European inspired menu of broths and stews. This mural has it all, faux stone & stucco, a trompe l'oeil awning, windows, wrought iron railing, vines and bicycle, signage, the works! I met a lot of curious people passing by on this one. Because of the deeply textured surface, we decided to forgo hand painting the Bistro sign, with all its intricate details, and instead design it in Photoshop and print on aluminum sheet metal to be installed later as you see in the photos. 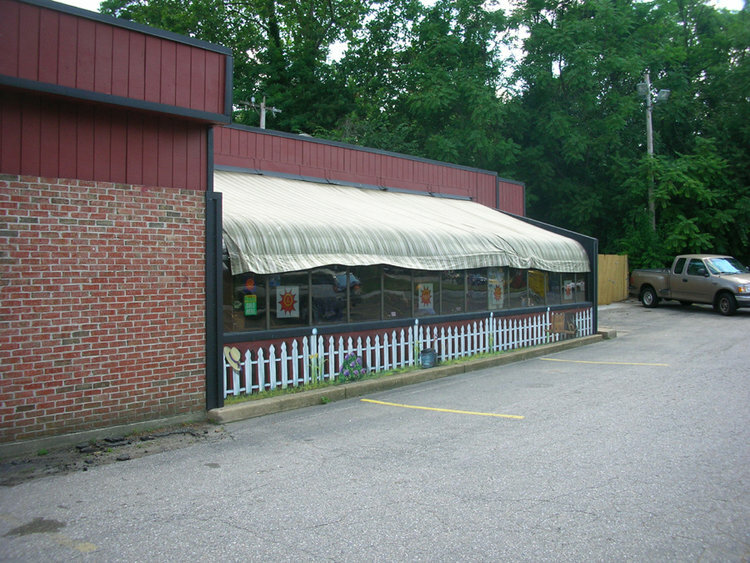 You'll notice two different window awning styles represented in the photos. 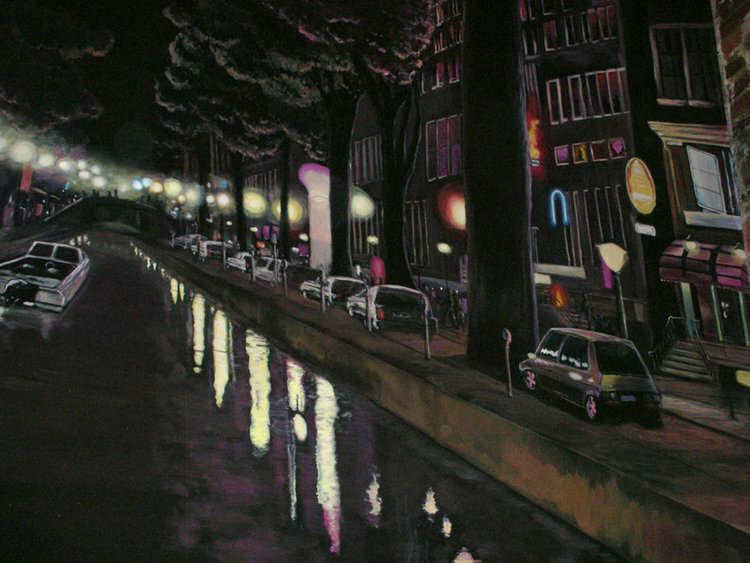 This discrepancy is because the owner, Noelle, changed her mind midway through the painting process. We ultimately went for the black and white stripes that matched the side awning and the interior drapes which I think was a good choice in the end. Flexibility is key when designing for a client. Patience and humility as well. That black rectangle you see below the window was purposely left to add a real flower box and kitchen herb box in the springtime. I'm not sure if they have made it a reality but that was the plan. 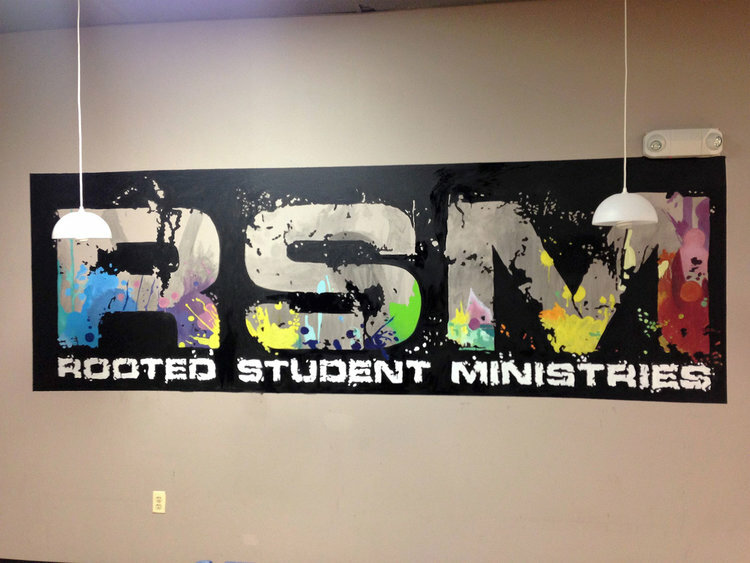 RSM stands for Rooted Student Ministry and is a new over arching term for the middle school and high school student ministries led by Luke Casagrande at Grace Fellowship Church. 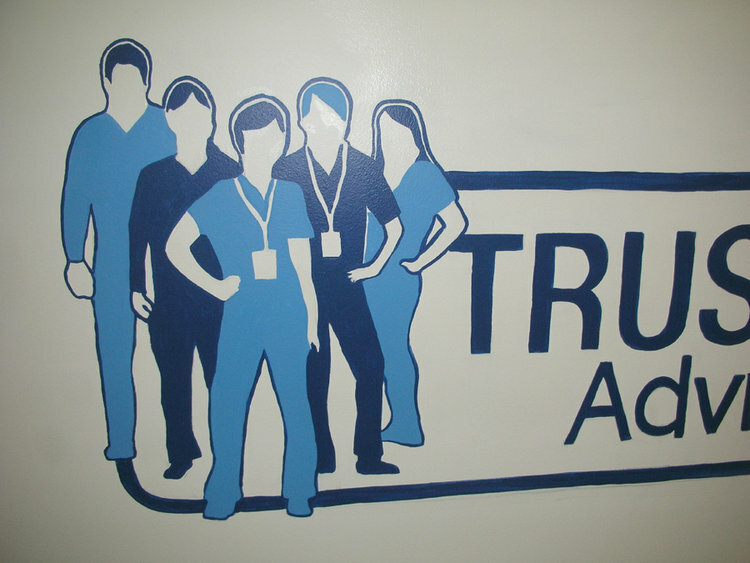 I was asked to recreate their logo on a wall in the common area where the students hang out. This was a one day project. We actually filmed a time-lapse video of the event and used it as an intro to some of our RSM promotional material. 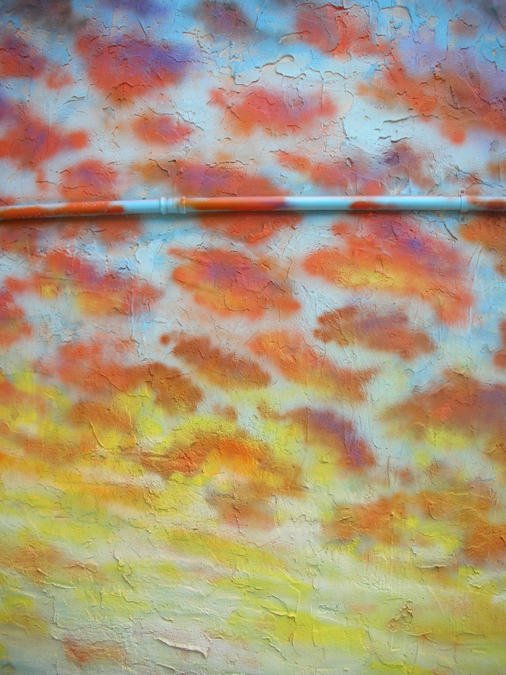 and stretched it across the wall covering the offices and bathrooms. More crabs for Loafers! This time accompanied by two beer mugs 6 ft. tall. All four sides of this building are now covered in artwork depicting either steamed crabs, the Maryland flag or scenes of the Chesapeake Bay. 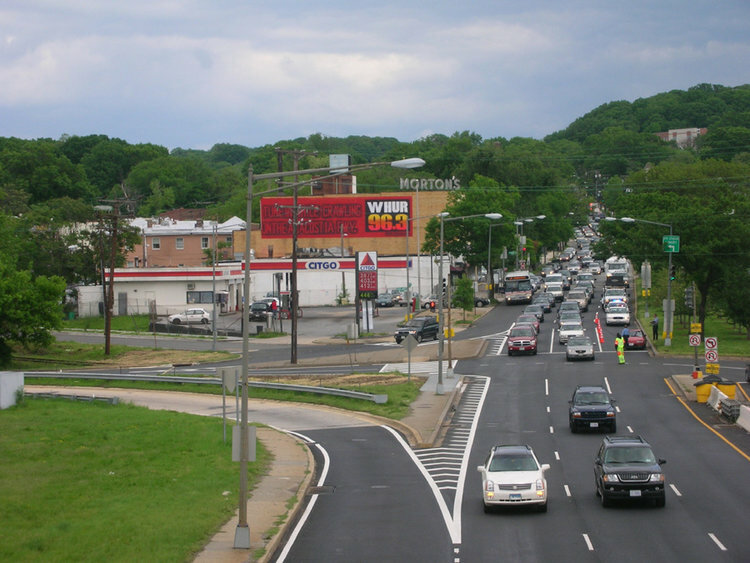 Its become a landmark of Route 40. 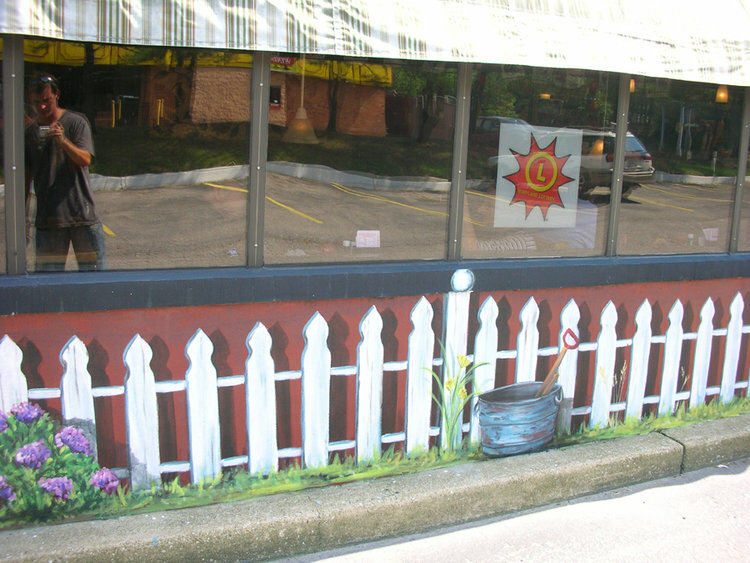 The owner, Harold, has an incredibly open mind about the exterior of his restaurant, much to my delight! This time he has asked for a crab, Maryland flag, Chesapeake Bay scene mash up! 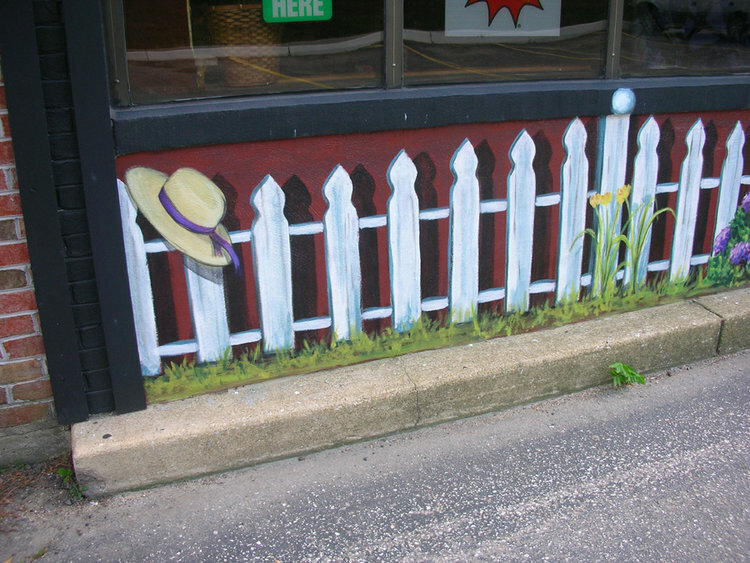 The entirety of this mural faces a busy Route 40 intersection in Ellicott City/Catonsville and offers the commuters something to look at while waiting for the light to change. While working a short stint on the 4am-noon shift in the MOM's produce dept. I had the opportunity to create a number of chalk board signs for the sales and special events the store was promoting on a daily basis. Greater than that was the opportunity to decorate the hallway bridging the first floor with the lower level which houses the offices, stockroom and freezers. The thought was to design something more employee friendly than the current cinder block wall, you know, for morale. At MOM's there is a culture within the company based on four principles which they call "The Purple Cows" They are as follows: MOM's opens early and closes late for their customers, MOM's will carry out your groceries for you, MOM's owner Scott is reachable by email (which is printed on every MOM's grocery bag), and MOM's recycles just about everything you can recycle. 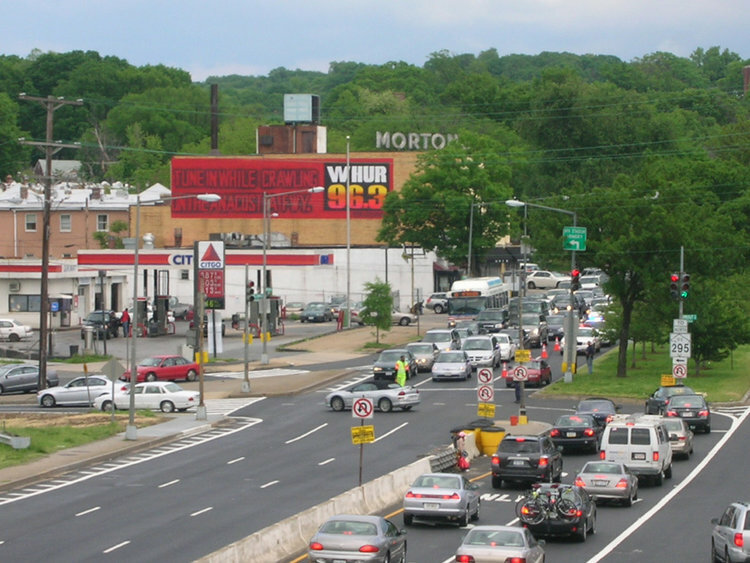 Besides the grocery store doubling for a recycling center, MOM's has other environmentally sound initiatives including a wind power credit exchange program, beehives on the rooftops and a few more. I attempted to represent some of these initiatives in the mural design as a reminder to the staff of the bigger picture as they climb the stairs. That when you are employed at MOM's you are actually contributing to something greater than yourself and making a positive impact in the world. And I thought painting purple cows would be fun. Another Children’s Ministry full room, panoramic mural. 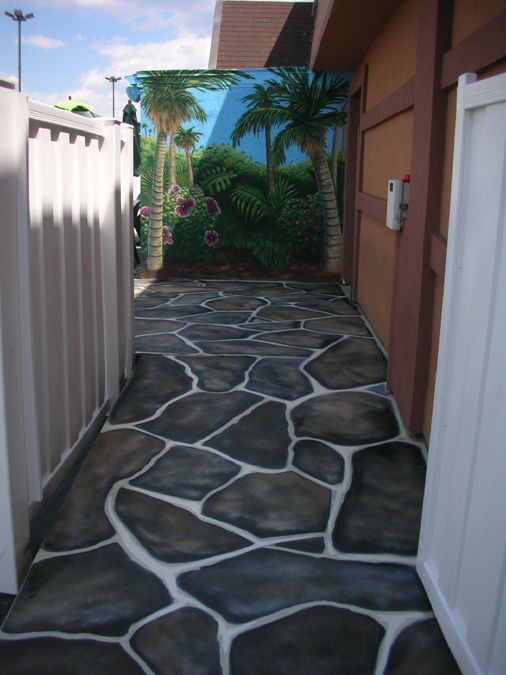 We wanted to create a safe, enclosed feeling courtyard in a suburban/urban setting. Thanks to my son Jacob Seese, Meg Garvin and the other volunteers for doing such a good job. For this room we went with a club house / tree house theme complete with tire swing, slide and outhouse. The main “room” is used as a backdrop for skits and worship with the stage riser directly in front. 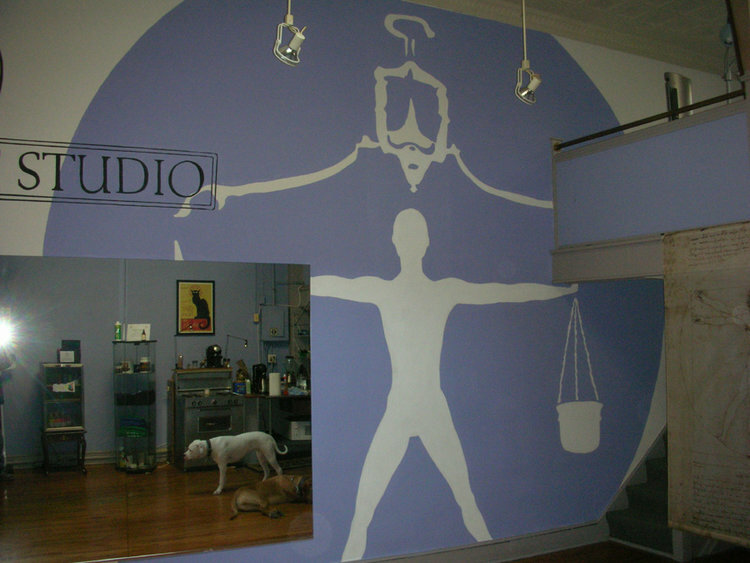 I spent a week painting this room. 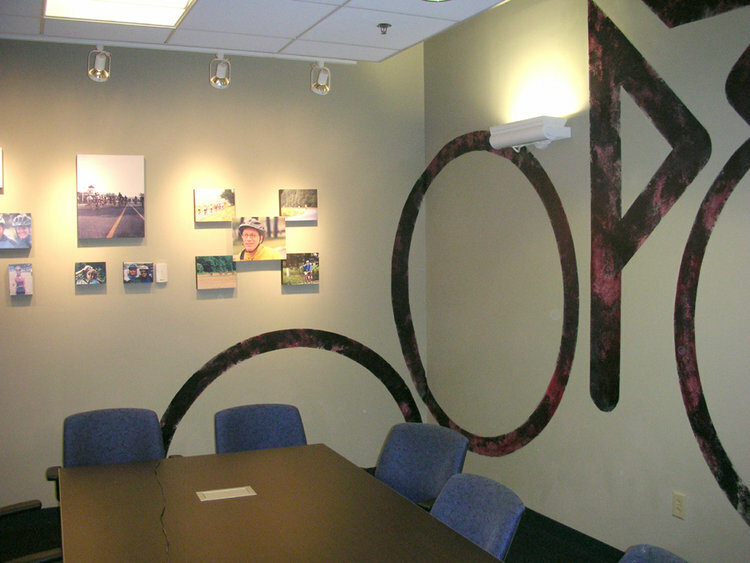 The Hub is an octagon shaped room that connects the children's ministry classrooms with the rest of the church building at Grace Fellowship Church in Timonium, MD. 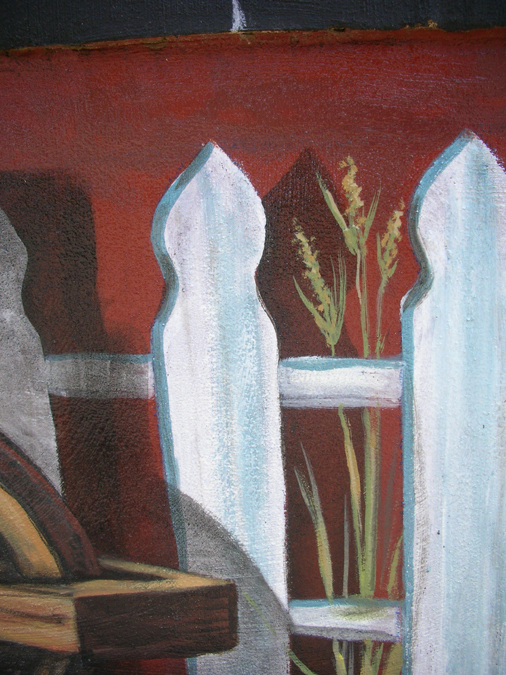 It's the front gates of the children's ministry, where the parents sign in their child. 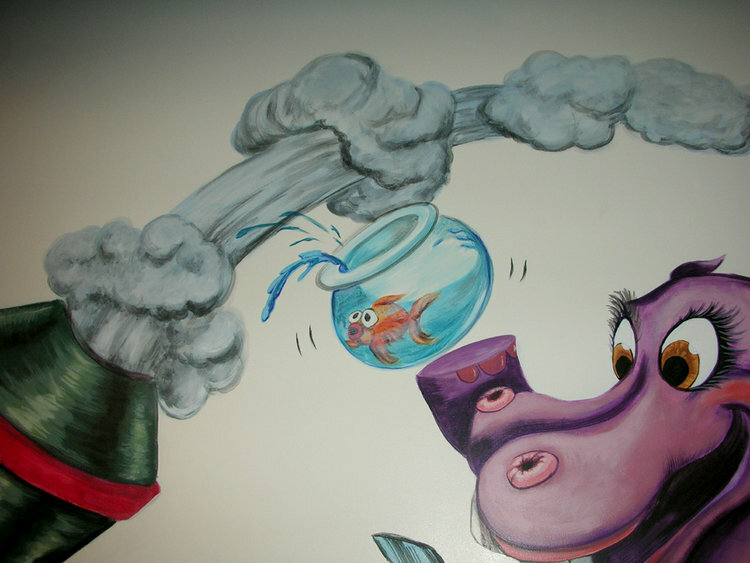 In fact, since these pictures were taken we have installed a floor to ceiling, climbable jungle gym complete with a curved tunnel slide in one side of this room that compliments the mural very well. They look like they were intentionally created together. I spent two weeks working on this panoramic explosion of color and cuteness. 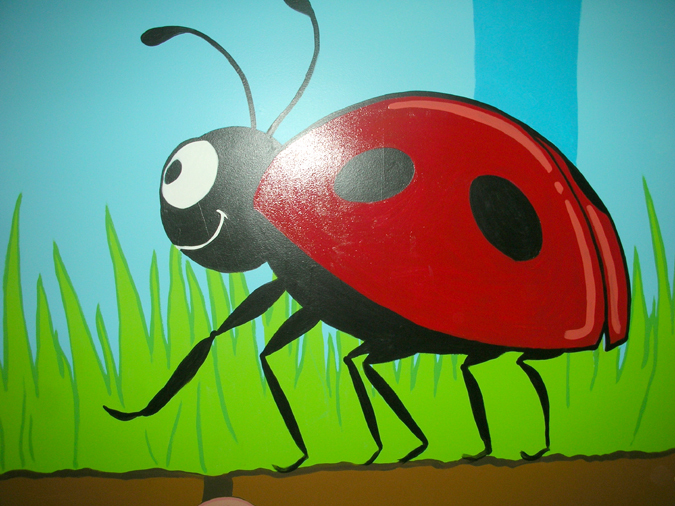 One of the Children's Ministry playrooms painted as if the viewer was roughly the size of an ant. The simple shapes and bright colors appeal to the young ones. 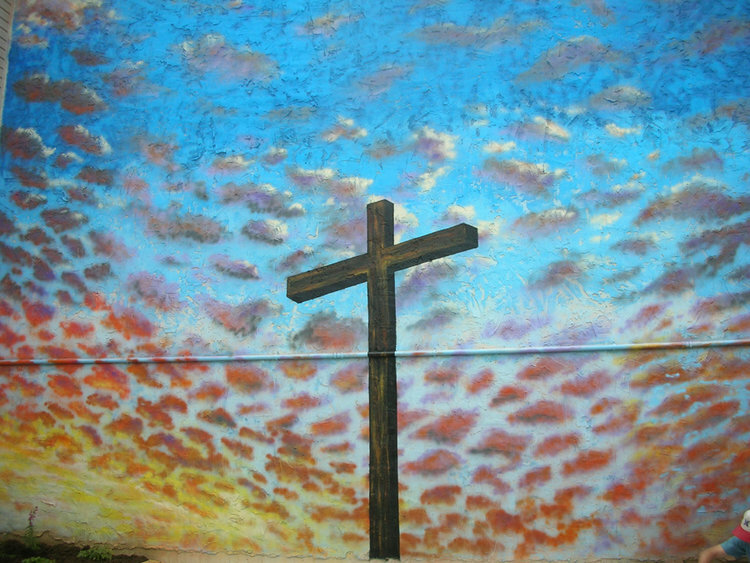 This one day mural was painted for the elementary age student ministry at Grace Fellowship Church where my family and I attend. 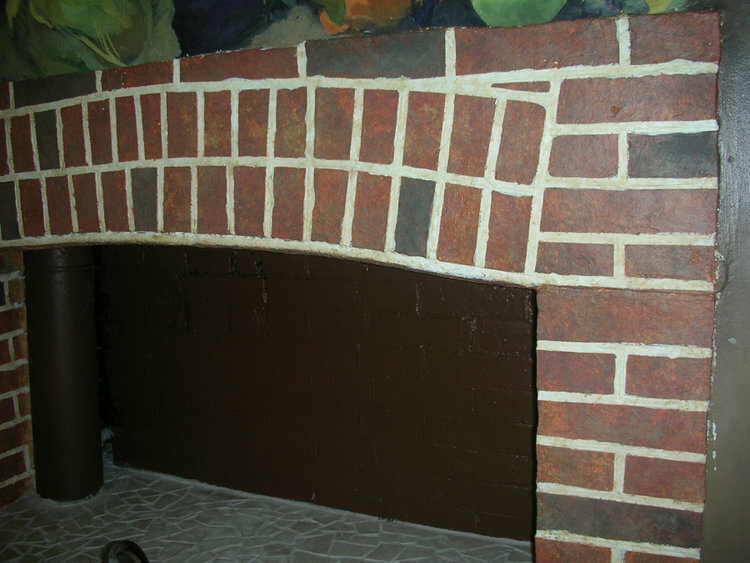 It was painted on fiberglass brick skin and used as a backdrop for performances and videos produced by the student ministry. 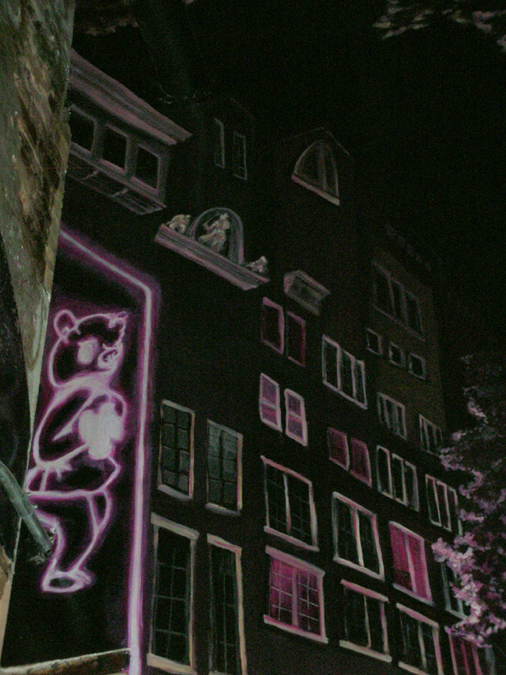 Its got a nice 80’s NY graffiti feel! Let me explain how I became involved with this project because it's a doozy. While attending the S.H.A.P.E. 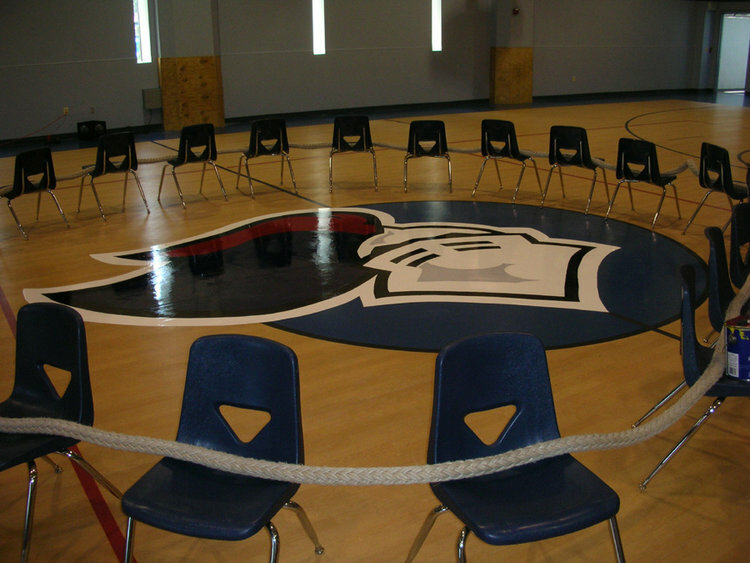 workshop at Grace Fellowship Church in the fall of 2010 I met a man named Mark who was sitting at the same table. He happened to be an artist and spoke about a Texas based orphanage that he was currently volunteering at named Arrow. 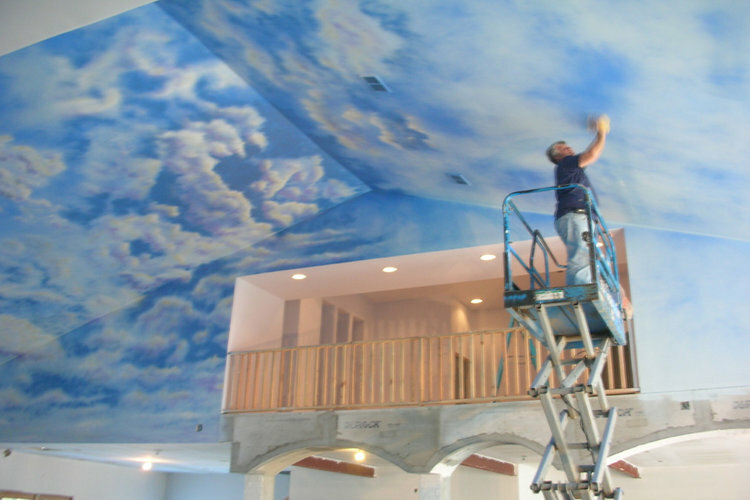 He went on to explain that they were looking for a muralist to decorate a courtyard at the facility. We exchanged numbers and I didn't hear from him until that following year. Before I knew it I was smack dab in the middle of a time-sensitive Eagle Scout project for a 17 year-old named Christian Posko who has been working with Arrow for the past two years on a courtyard renovation project for his Eagle Badge. 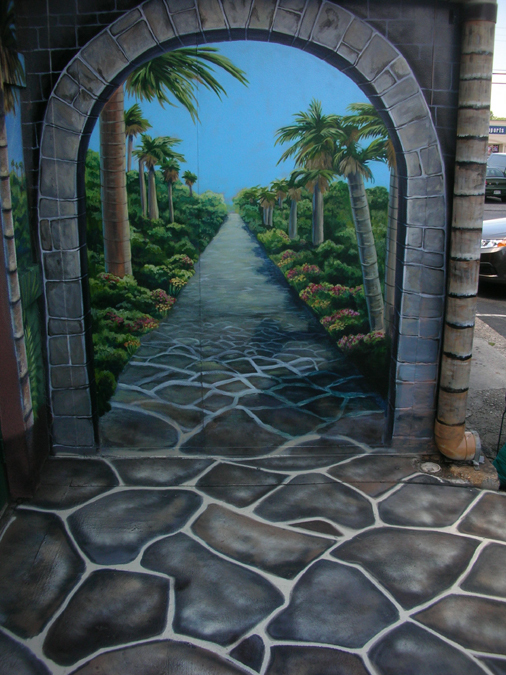 The re-haul consisted of a paver stone patio, benches for sitting, four corner gardens enclosed in stone retaining walls and a mural on the wall. This all had to be complete before his 18th birthday or else he would not receive the credit and honor of his Eagle Badge. This courtyard is meant to be a place of peace and comfort for the young men and women who live there. A place to cool off and reflect or just be. 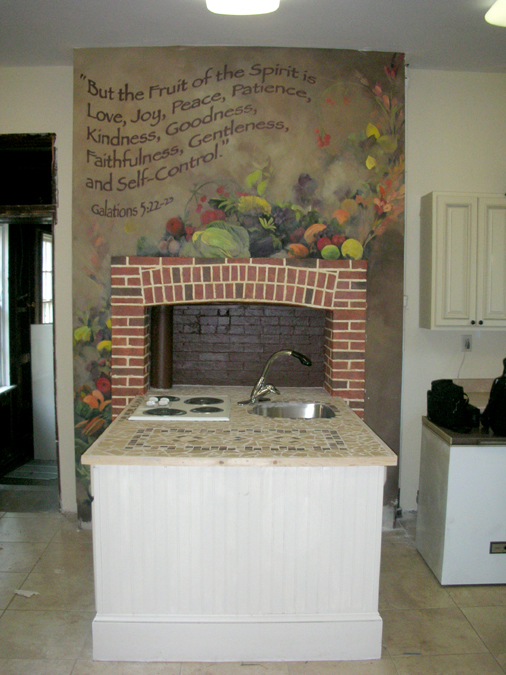 My contribution to this collaborative effort was the hand painted lettering and the faux brick fireplace. 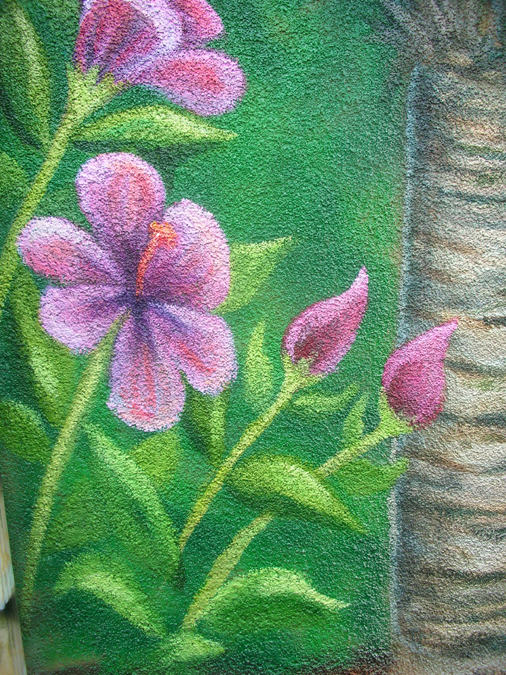 The beautiful fruit and vegetables were painted by Kami Tremblay, a friend and fellow muralist. 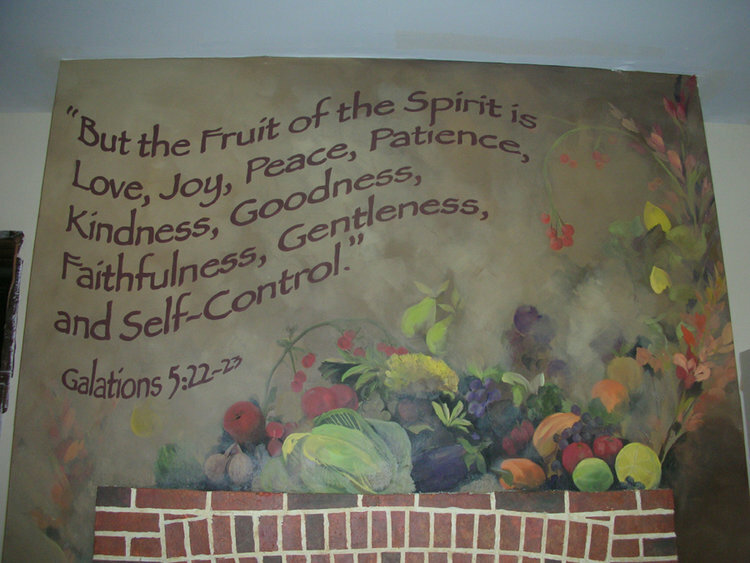 Again, its always nice to be able to incorporate scripture in my work. Esther's Place is a multi location, assisted living facility serving the elderly in the Baltimore/DC region. 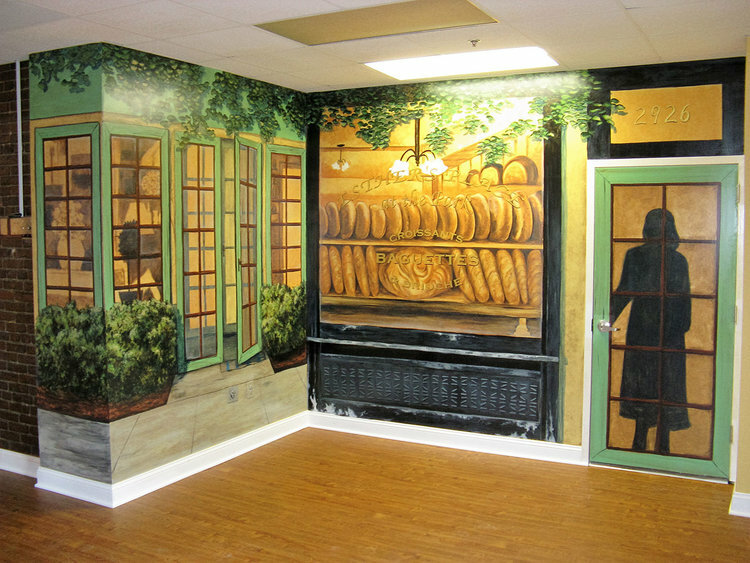 and depict a French bakery store front and a garden on the other end of the room. that the owners wanted to add some flavor to. 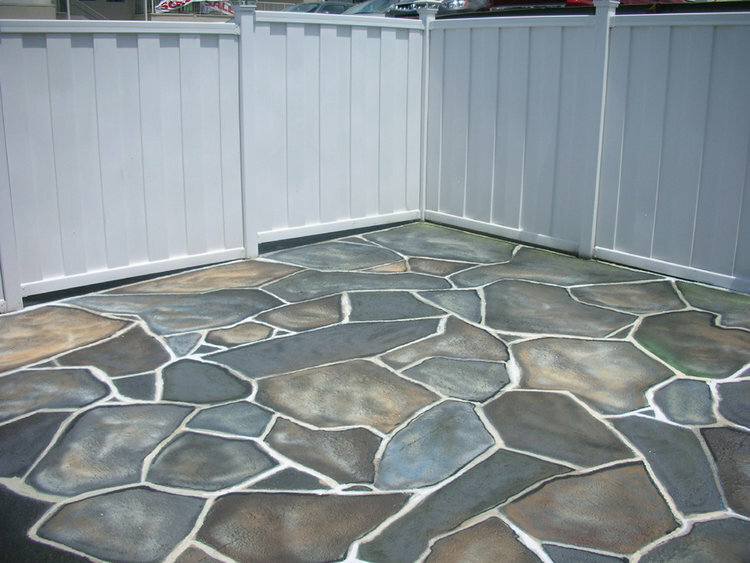 This was a 3 day project in the heat of summer but a fun challenge. 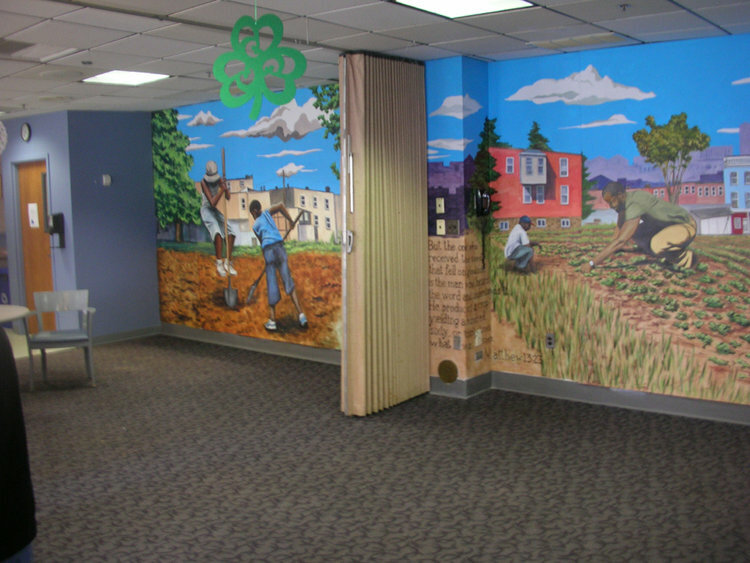 I had the honor of decorating a portion of the newly constructed Health Care for the Homeless building, namely the Children's wing. The new facility has the special capacity to serve three times as many people in need as their last building! 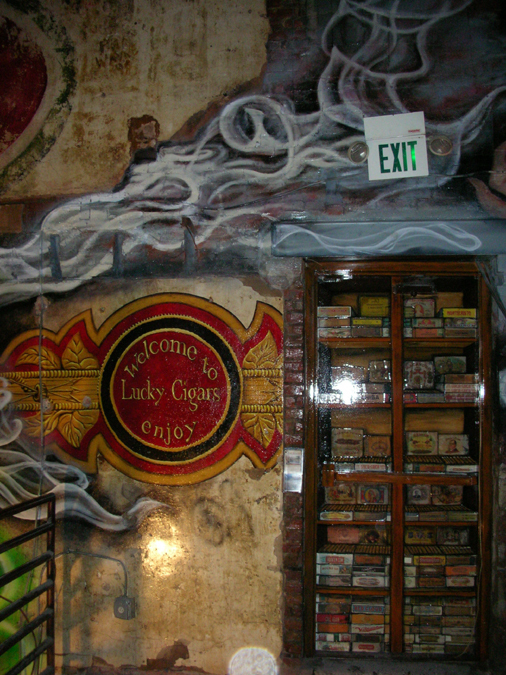 and a Lion's mouth tunnel welcoming you as the doors of the elevator open. I like the movement and frivolity of this piece. Ray Lewis of the Baltimore Ravens and an un-named Ravens Cheerleader gracing the men & women's bathroom doors at Loafers Sports Bar & Grill. 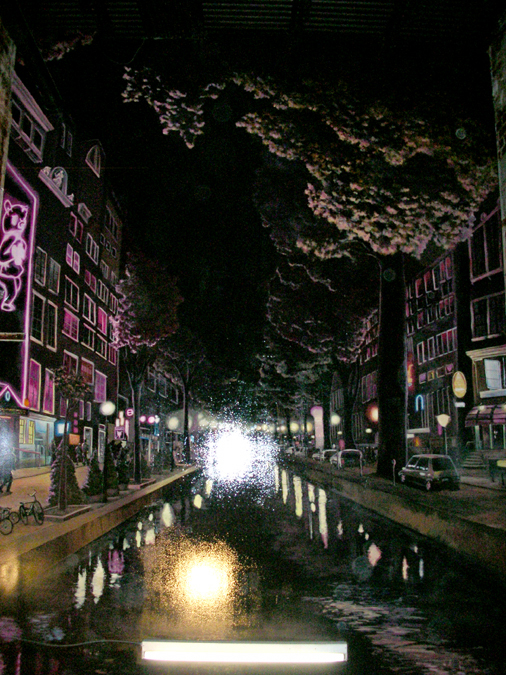 These were painted in 12 hours over a two day period. 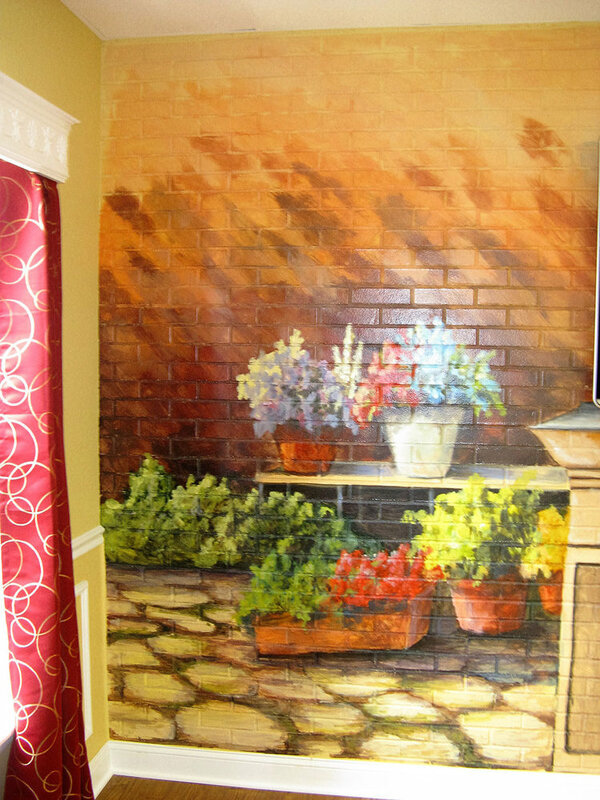 As you can see the photos were taken before I painted the faux brick on the walls. 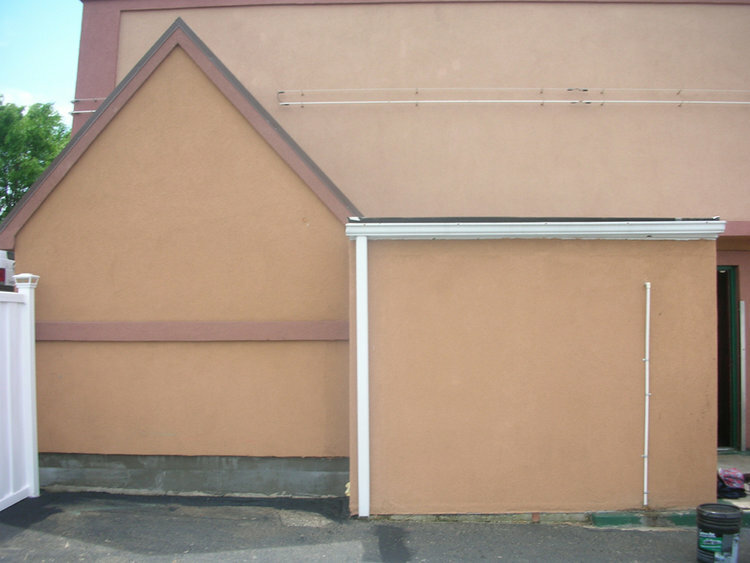 Bit by bit I was allowed to transform this entire building, interior and exterior! 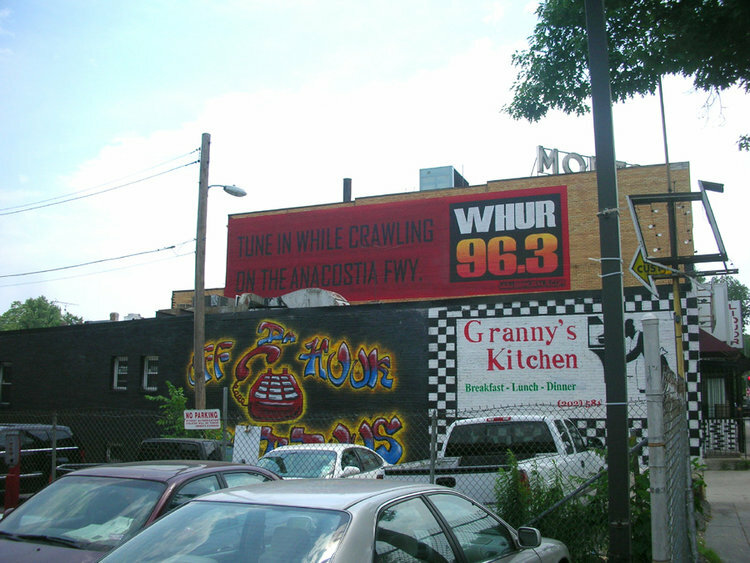 A large commissioned work by the Hustler Club on the Block in Baltimore City. 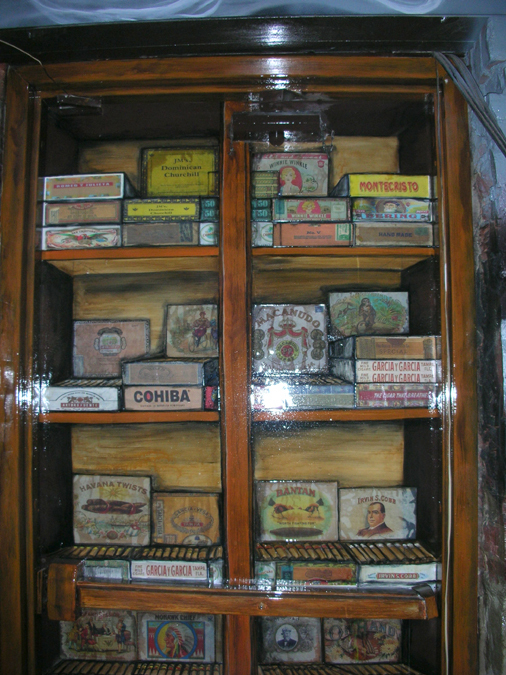 They were opening a cigar shop next door and wanted to decorate the stairwell in between the two establishments. 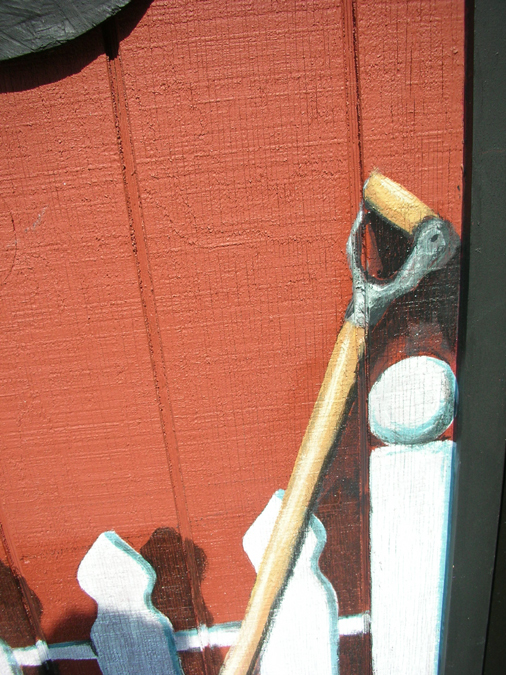 After painting, we chipped, scuffed and otherwise aged the mural to look like it’s been there for a long time. 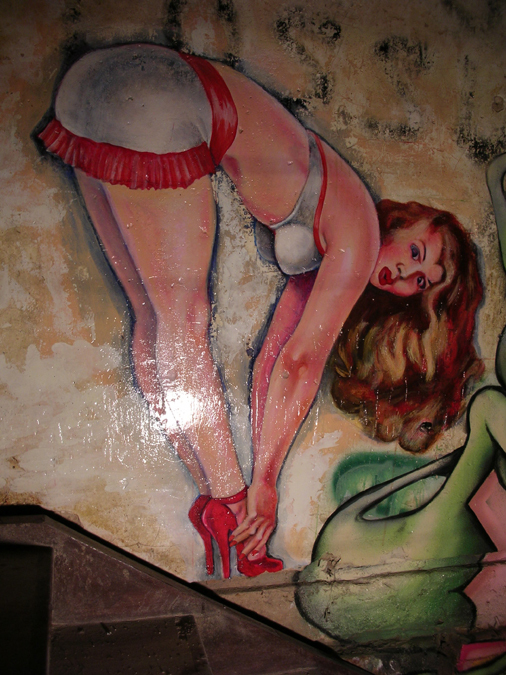 This mural had it all! 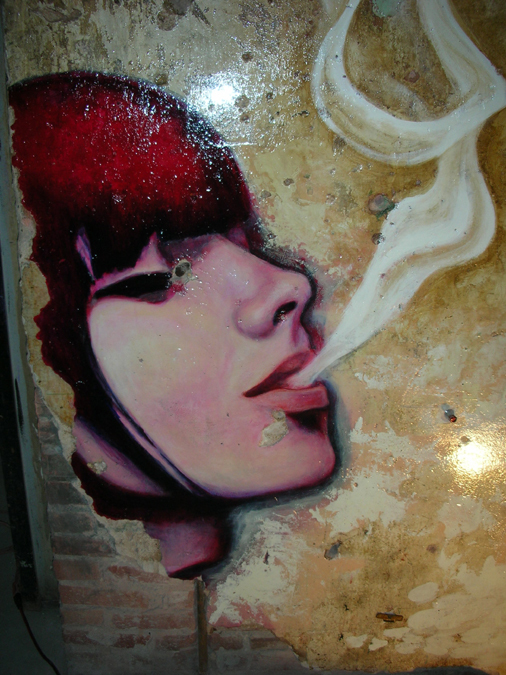 Graffiti, figures, signage, smoke, neon and night painting. It was fun and challenging. Thanks to my friend Ryan Emge who helped me create this masterpiece. 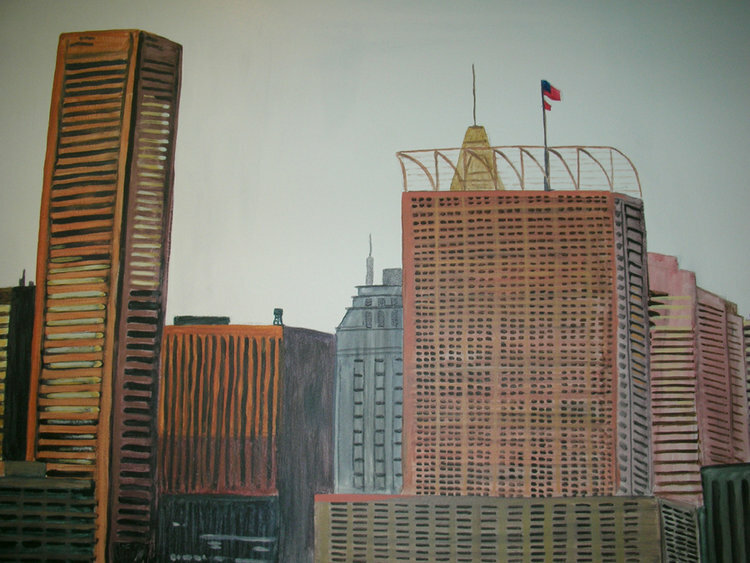 These are two murals painted for the Sears Baltimore Office. 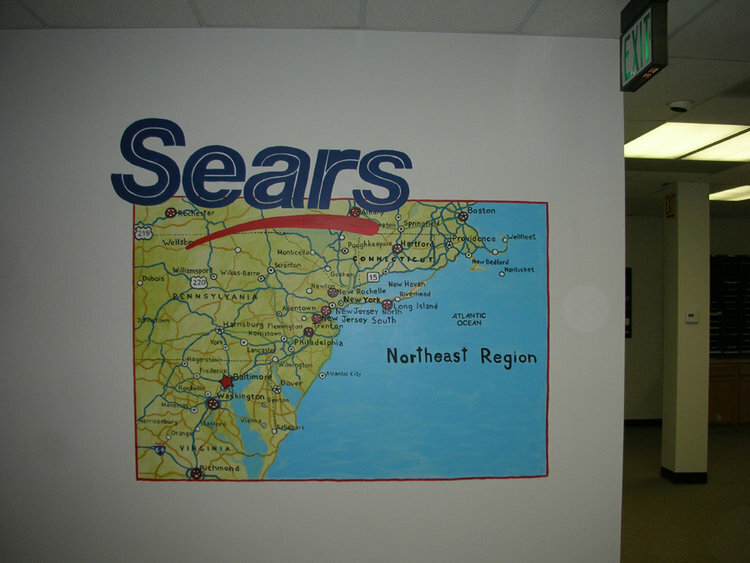 The first one depicts the Eastern Seaboard and the Sears location on it while the second shows a view of the Inner Harbor with a Sears logo and Welcome sign. Moveable Feast is an incredible organization that feeds people suffering from HIV/AIDS who are too sick to leave their houses, hand delivering three meals a day to thousands of people in need. 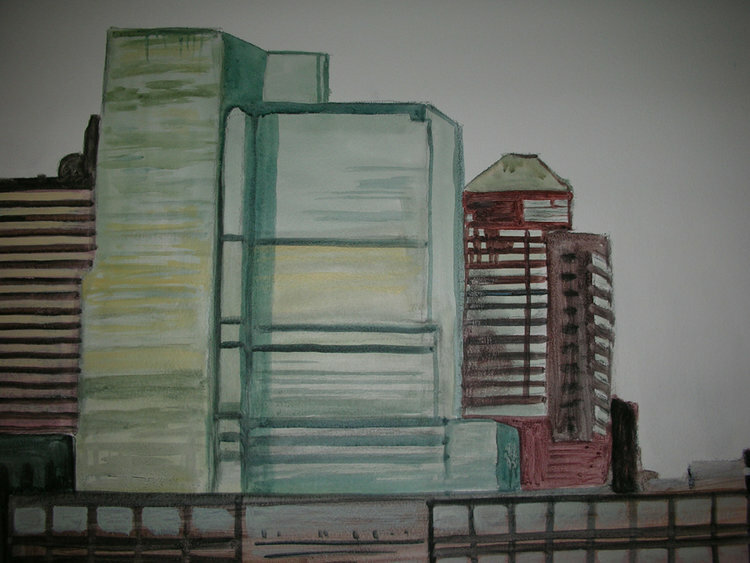 I had an intern from St. Paul's School for Girls with me on this two-day project. Marie Rasasco was a very knowledgeable and capable assistant and is currently going to college to study theatre set design. 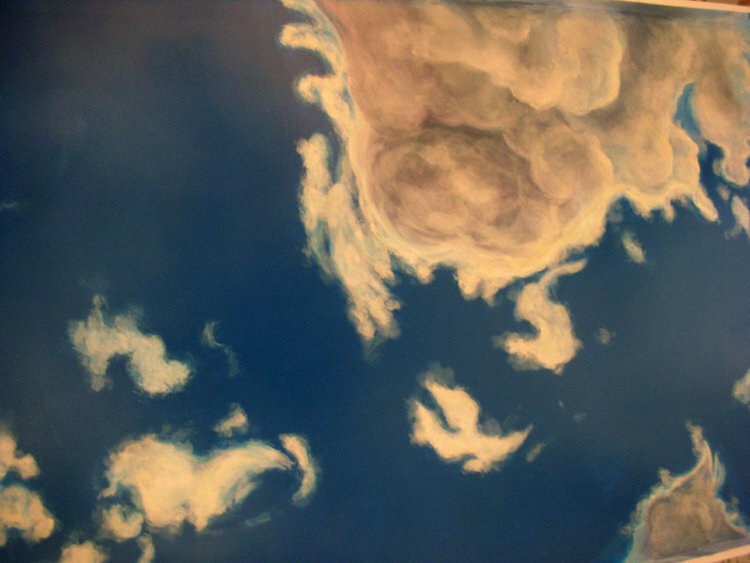 She spent two weeks with me that summer working on several murals. The bike theme was chosen because of their biggest fund raiser, an annual bike race. Although they use a van to deliver the meals. 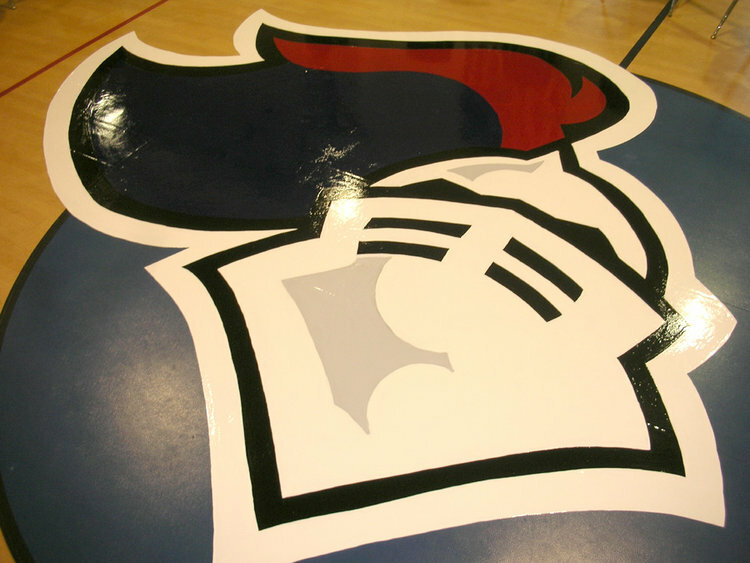 Grace Baptist was stepping things up a notch in the gym and commissioned a logo design and painting on the gym floor. With this project I had a chance to work with an epoxy paint from CA made to withstand the wear and tear of athletes on a daily basis. 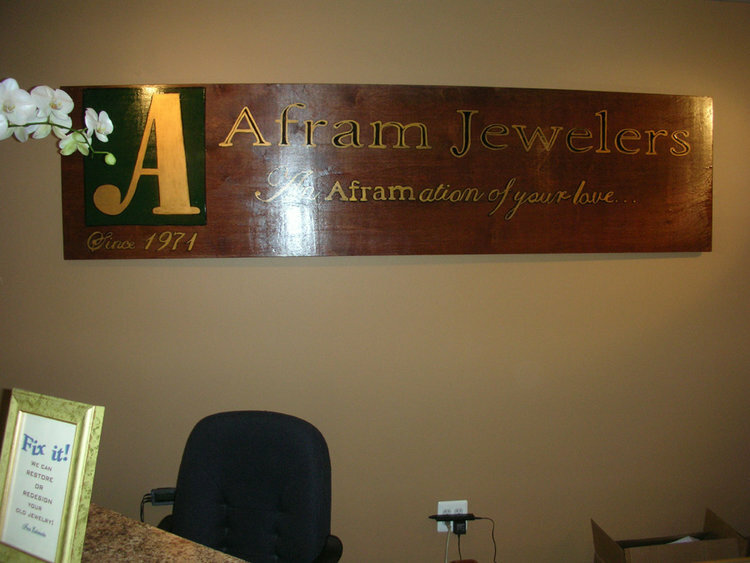 This is Afram Jeweler's new and larger location on 15th & New York Ave. in Washington DC which is just a few blocks from the old store. They are doing very well and it was time to expand. 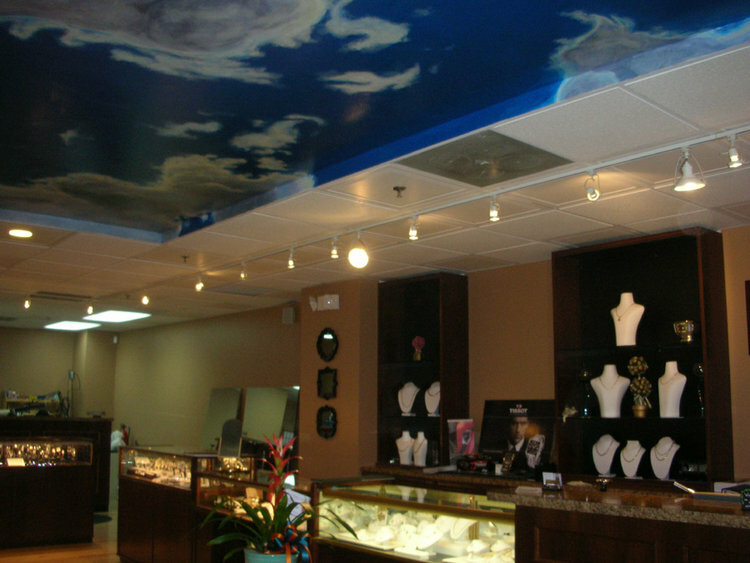 I spent a few days painting the sky ceiling while the electricians were lighting the store and other crew were installing the ceiling tiles. 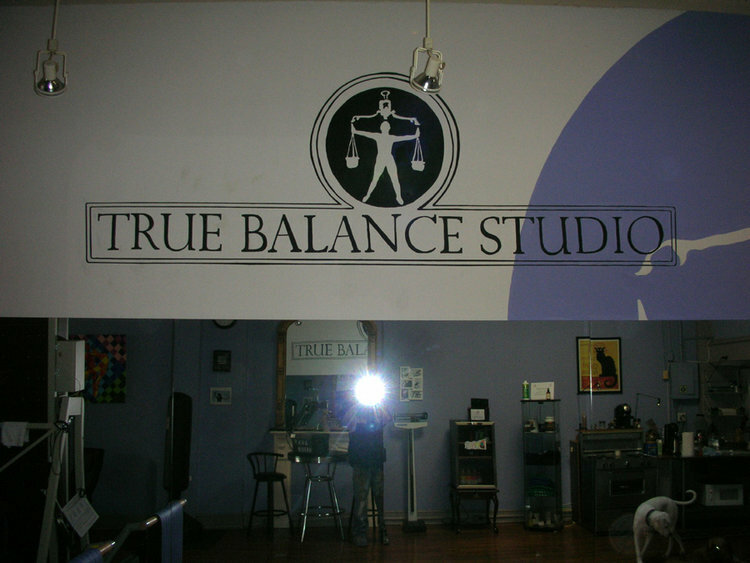 In addition, I hand-painted an 8 ft. sign to match the existing wood furniture with the Afram logo and tagline. 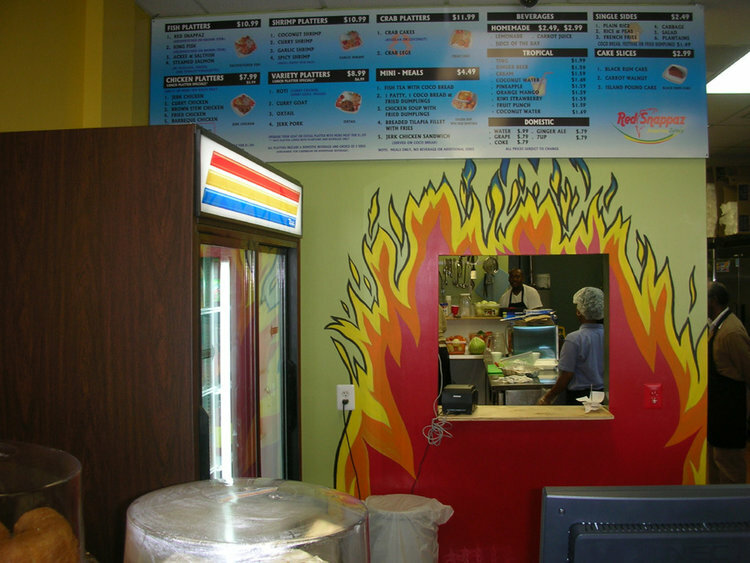 Jamaican Jerk Chicken & fish at it’s best! 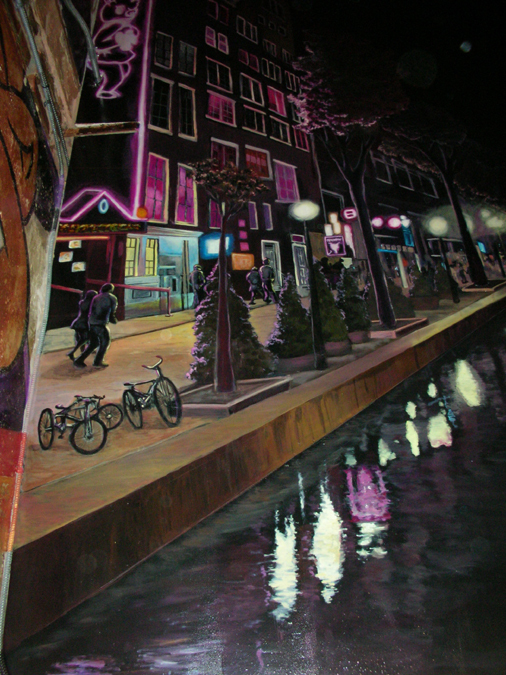 After the murals I also painted their delivery van for them. 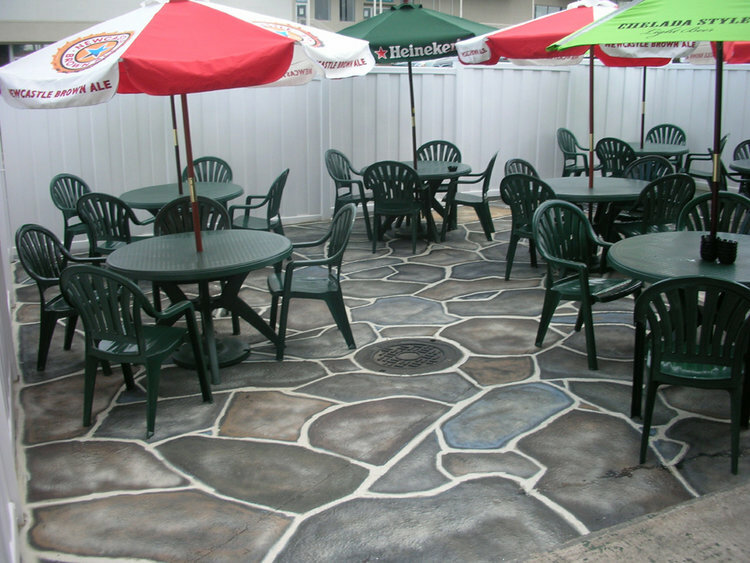 Loafers new outdoor seating area has a tropical flare enabling its patrons to relax in style. 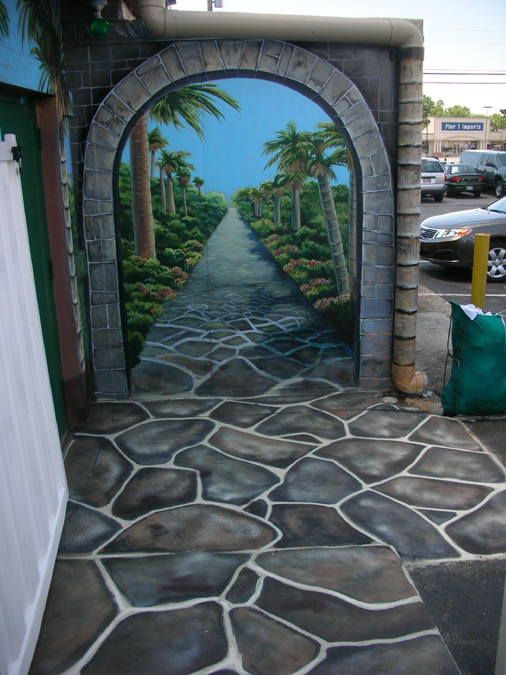 Besides the sub tropic forest scene and trompe l'oeil archway I also painted the black top in a flagstone patio motif. 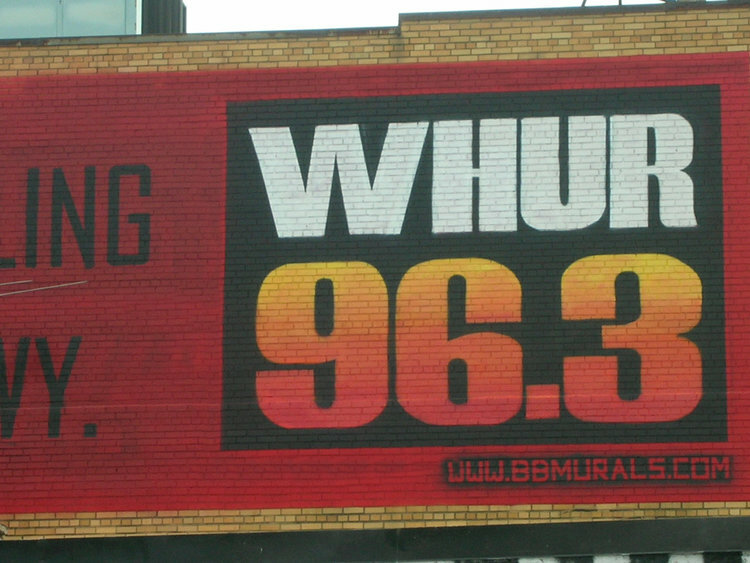 The WHUR was the first major advertisement mural for BB Murals. 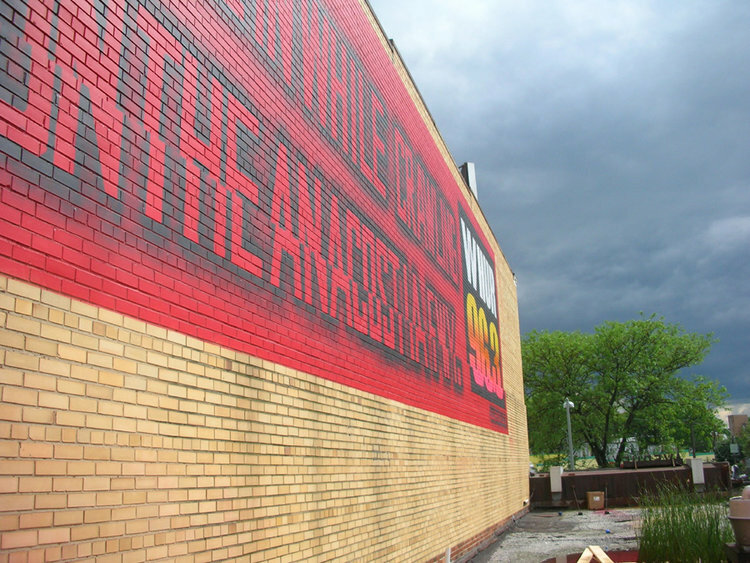 A collaboration with Provision Outdoor and Adworks of DC, we pulled off something rarely seen. I wish I could say without a hitch but this job was wrought with danger and problems. 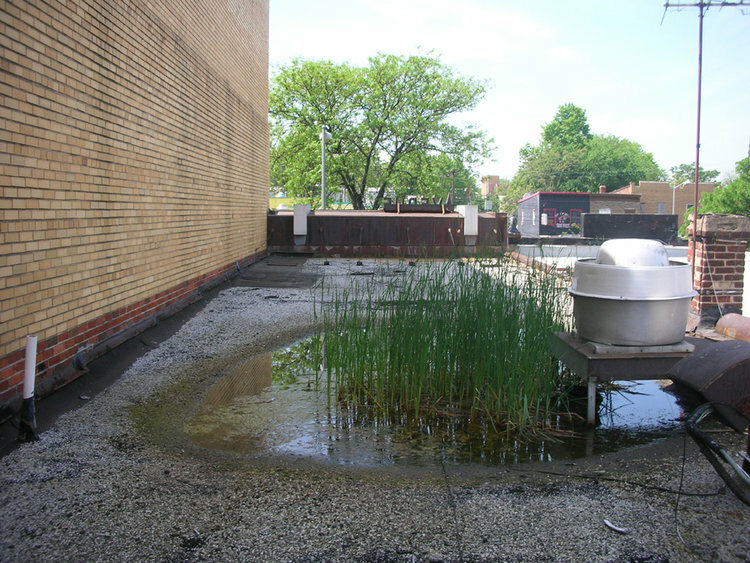 The first of which was the growing ecosystem on the rooftop in the form of a 16 ft. pond which was in the pathway of my scaffolding. 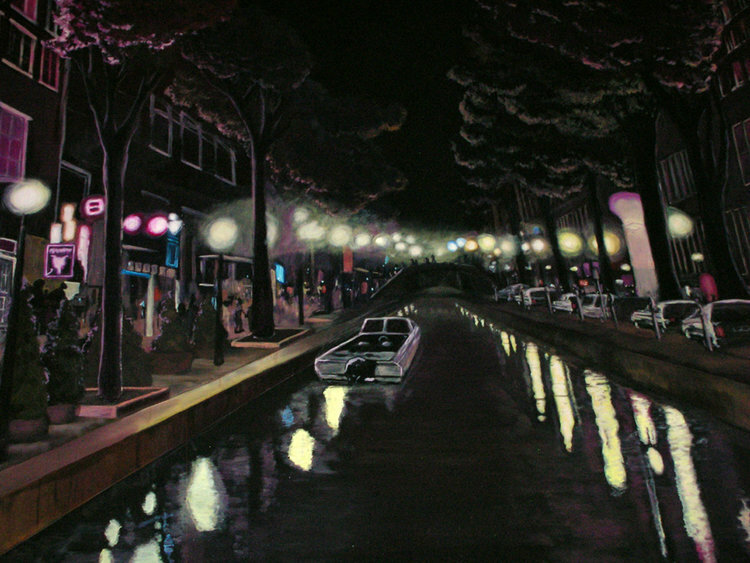 After a 5 day painting marathon, the ad was complete. Later we discovered that changes had to be made to the design and I was back up there again to fix it. 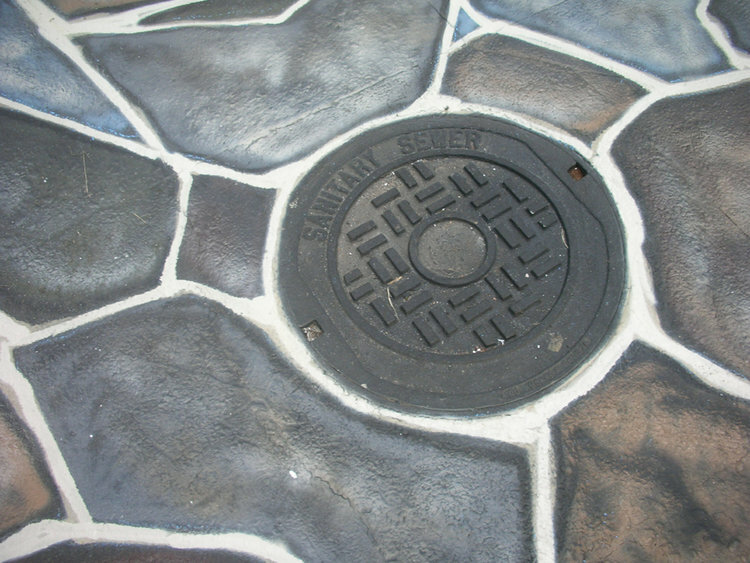 The final design had black lettering which we thought would be more visible from afar. 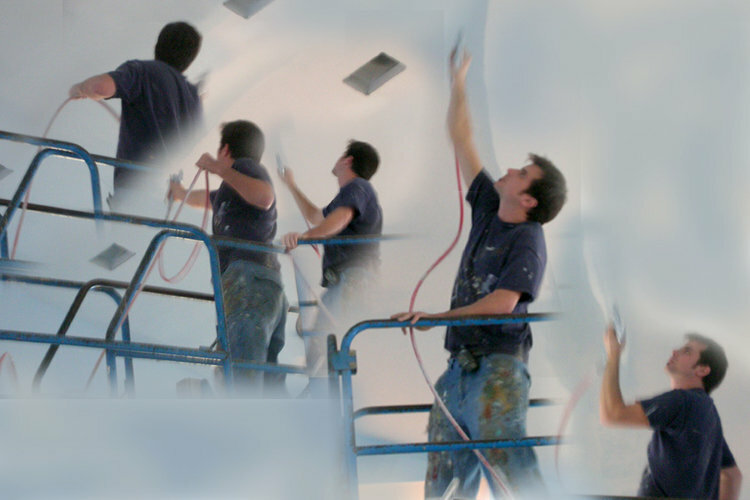 In between painting the designs, the roof collapsed and was rebuilt just in time for me to paint the second time. This was an excellent lesson for me in perseverance and determination as I satisfy my own standards as well as the clients. It was a true test. 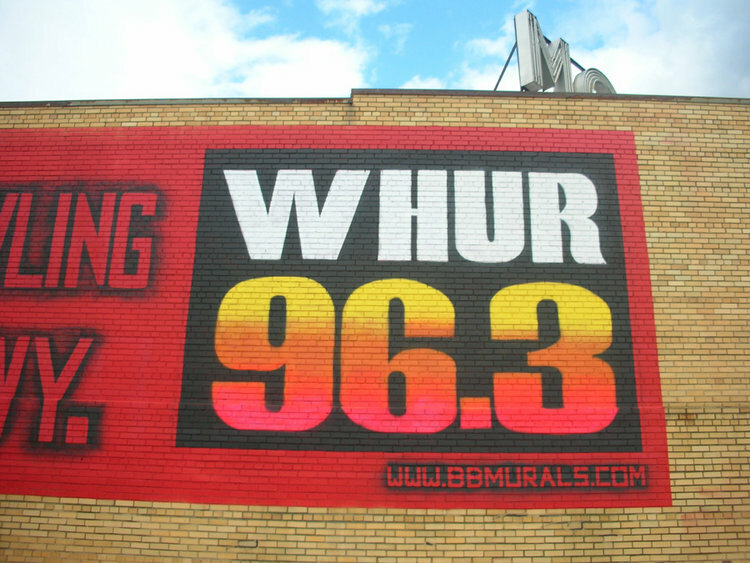 After the WHUR mural, I was hired on the spot to paint two more in the area seen below. 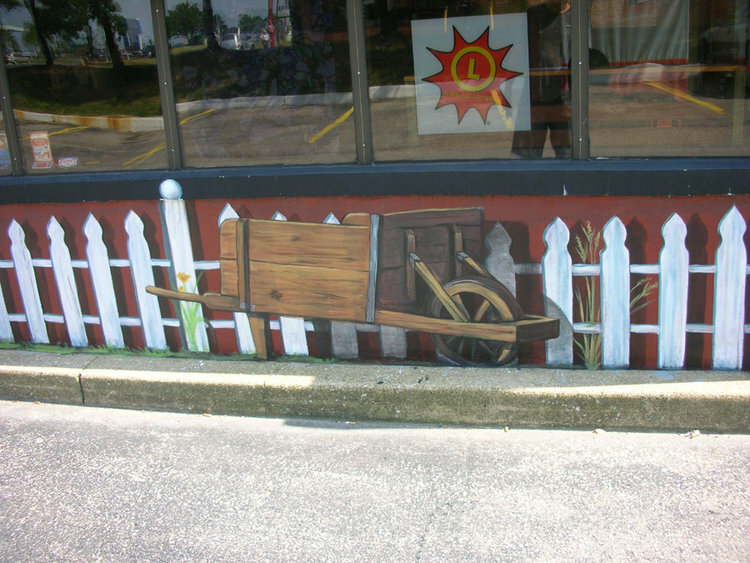 tHe Granny’s Kitchen sign and Off Da Hook Tattoo’s. As partial payment I received a free tattoo on my back of my Astrological sign Sagitarious. This 2,300 square ft. ceiling is just the first step into transforming this space into a 50's style indoor gas station set. 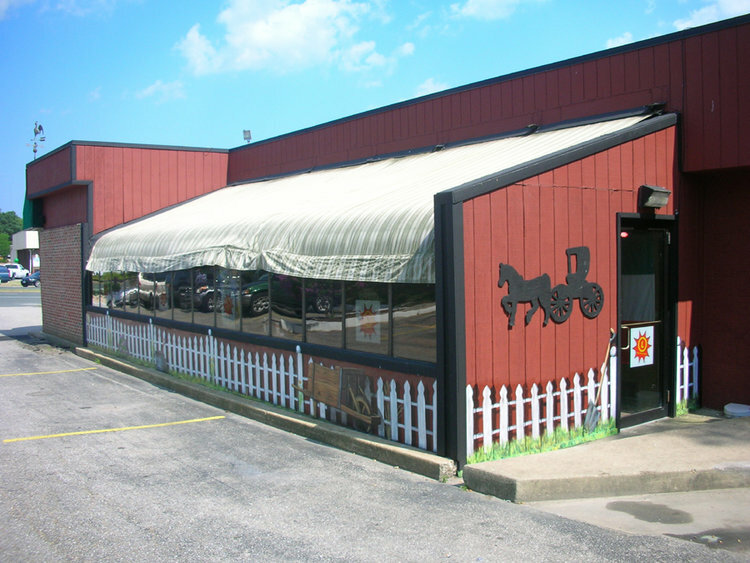 Complete with paved roads, vintage cars, street lights, true to era gas pumps and American memorabilia filling the location. 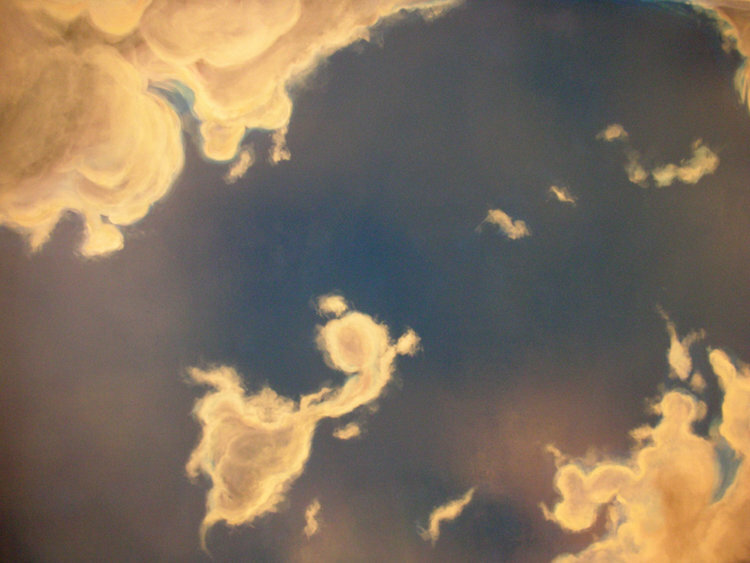 I spent a week working on the scissor lift and using an airless sprayer and spray paint to achieve the faux sky look.